The Las Conchas fire started on June 26, 2011, near the small community of Las Conchas in the Jemez Mountains of north-central New Mexico. When the fire was contained on August 3, 2011, it had burned 156,593 acres of mixed conifer, pinyon/juniper and ponderosa forest and at the time was the largest wildfire in New Mexico history. Peak burn severity was extreme; over 60,000 acres of the total burned in the first 2 days. Soil-hydraulic properties examined are field-saturated hydraulic conductivity, sorptivity, and saturated volumetric water content. Sample sites were randomly selected across the full spectrum (7 classes) of wildfire burn severities. Shallow soil cores were collected from these sites. Hydraulic properties of the soil cores were based on tension-infiltrometer measurements in the laboratory. To minimize uncertainty, the measurements were analyzed using three separate methods. Assess post-wildfire impacts on hydraulic properties of soil as a function of remotely-determined burn severity. Possible applications of this work include assessment for water-related hazards and other water-resource management tasks. Soil core samples collected in the Las Conchas Fire burn scar. Top and bottom surfaces of the soil and core caps are the fourth sample from site LC–152. 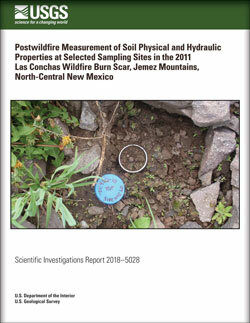 Romero, Orlando C.; Ebel, Brian A.; Martin, Deborah A.; Buchan, Katie W.; Jornigan, Alanna D.
Romero, O.C., Ebel, B.A., Martin, D.A., Buchan, K.W., and Jornigan, A.D., 2018, Postwildfire measurement of soil physical and hydraulic properties at selected sampling sites in the 2011 Las Conchas wildfire burn scar, Jemez Mountains, north-central New Mexico: U.S. Geological Survey Scientific Investigations Report 2018–5028, 35 p., https://doi.org/10.3133/sir20185028.